Author Written by Harmeet and last updated on Posted on January 30, 2018 . 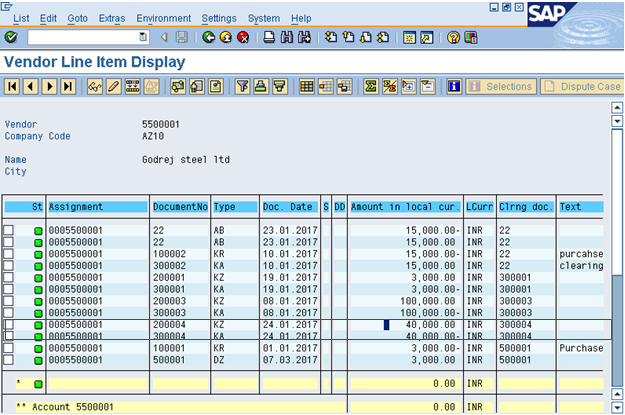 This tutorial will discuss document reversal in SAP. 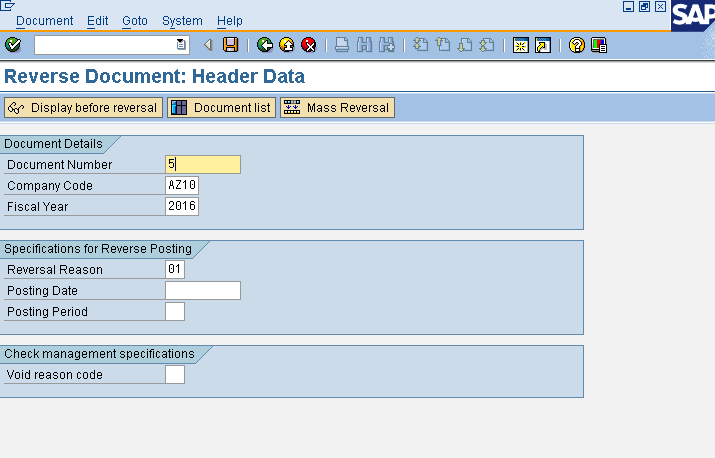 The tutorial is the part of SAP FI course and you will learn about SAP document reversal (how to reverse a wrongly posted document under various scenarios). The document that needs to be reversed is originated in FI. The document has not yet been cleared. The FI document must not be generated from an external system (e.g., via IDocs). The documents are related to G/L, AP and AR. At the time of reversal all the additional assignments are valid like business area, cost centers, tax codes, etc. 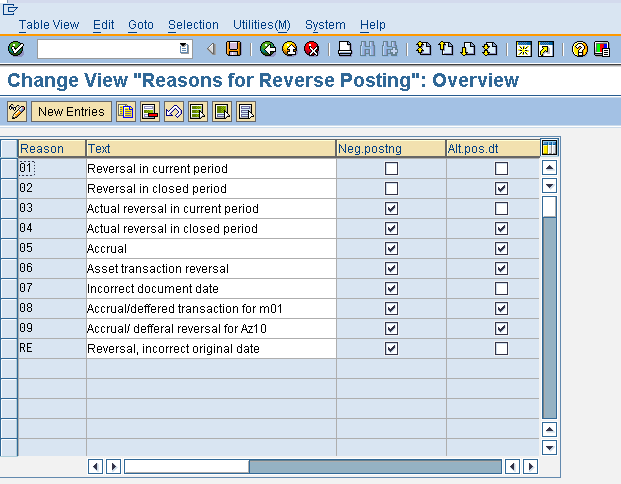 When we talk about reversing documents in SAP, there are different types of reversal scenarios. 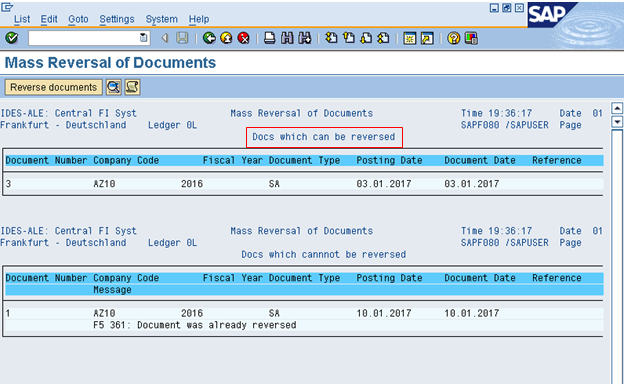 These types of SAP document reversal are explained below. 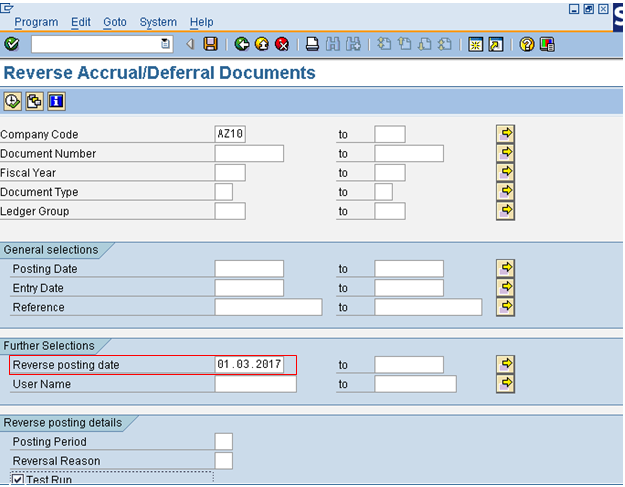 Under individual SAP document reversal, we can reverse one document at a time. Suppose the user has posted a document wrongly, now they want to reverse the same and post a new document again. Here, we are taking an example of simple Rent Posting (document number 5) which needs to be reversed. Follow the menu path as specified above or type FB08 in the command field. Document number: Number of the document for which reverse posting is to be created. Company Code: Company code for which document is to be reversed. Fiscal year: The fiscal year in which the document is created. Reversal Reason: We need to give a reversal reason at the time of reversal. The reason for the reverse posting is noted in the reversed document, the field is necessary to know why the reversal is done. The reason for reversal also determines whether the reversed document is allowed to have an alternative posting date and whether the reverse document is to be created from negative postings (explained below in Accrual/Deferral documents reversal). Posting Date: At the time of reversal we need to give the reversal date. If we do not give the reversal date, document is reversed on original document posting date. 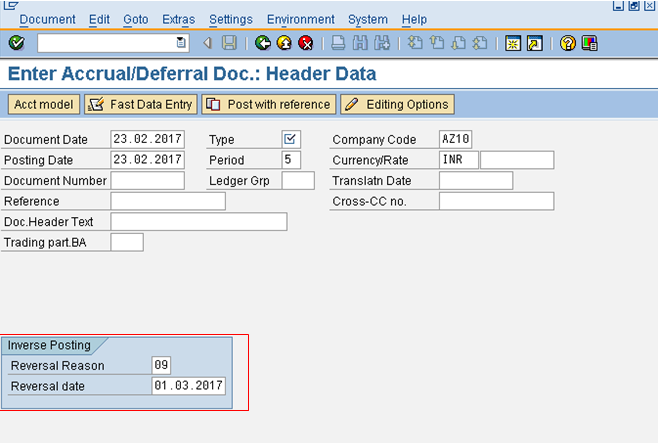 Posting Period: Period should be open for SAP document reversal. Void Reason Code: Enter the reason to void the check, if the document is allotted check for payment. We can see the document posted before reversal by clicking icon. After this, select the back-arrow button and select save button. Here in this example, we are leaving the posting date blank, so the document will be reversed on original posting date. We can see the reversed document by entering document display transaction code in command field FB03, document #5 was reversed by document #24. We can see that the document is reversed as rent is credited and cash is debited. Although reversed document is part of G/L posting, document type for G/L posting is SA but document type for reverse document is AB, this helps in easy identification of the document. 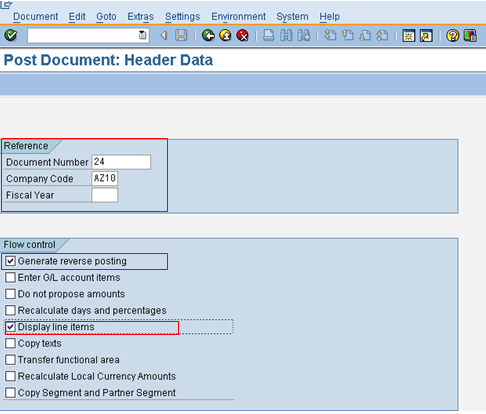 For reversal of a reversed document, just go to document posting by entering transaction F-02 (G/L Document Posting) in the command field and then go to Menu -> Document -> Post with reference. 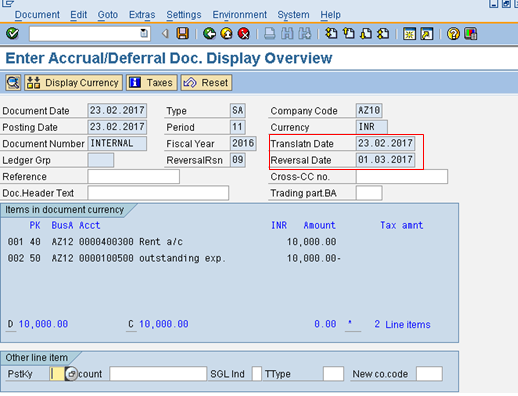 We can see the reversal of a reversed document below as the rent is again shown as debit. Mass reversal is used to reverse more than one document at a time. The document numbers can be continuous or random. For mass reversal, we can select random document numbers or range of documents. 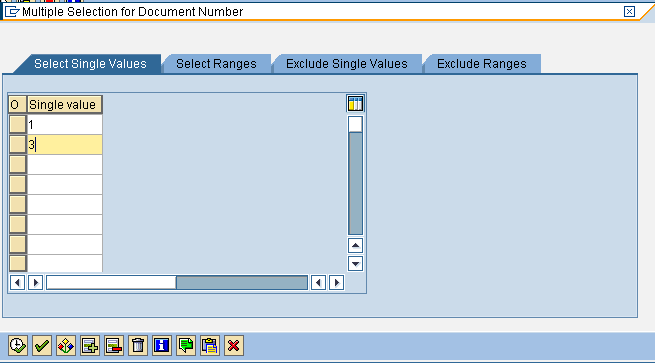 We even have the option to exclude some documents from the single values and range of documents. 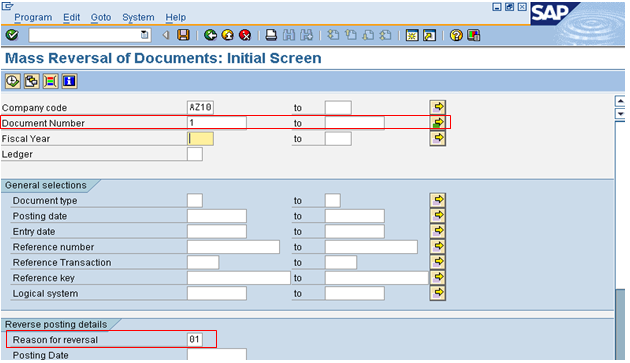 Use buttons to make selection of document numbers, also give reversal reason as 01. Here, we have selected Document 1 and 3 for reversal, after that we will execute the test run. We can see below that document 3 can be reversed while document 1 cannot be reversed as document was already reversed in the test run result screen. Reverse the document by clicking icon, and the document number 3 will get reversed. 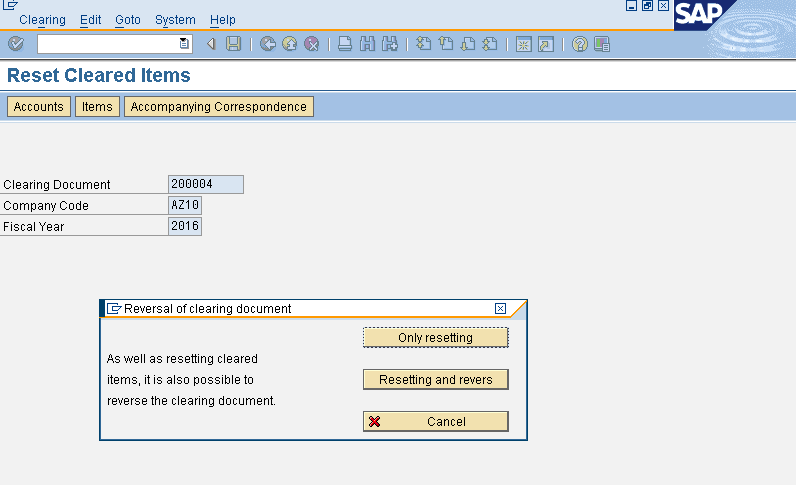 Cleared items are the documents in SAP that do not have any pending obligations. These documents are used to offset the dues of vendor, customer and G/L accounts. In this tutorial, we will take an example of a vendor payment. 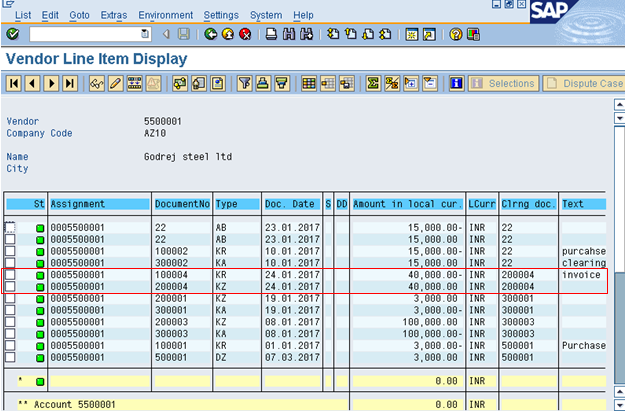 We can view the vendor line item report by entering the transaction code FBL1N in the command field. Here, for Vendor Account # 5500001 in Company Code AZ10, select Cleared item radio button and normal item check box. 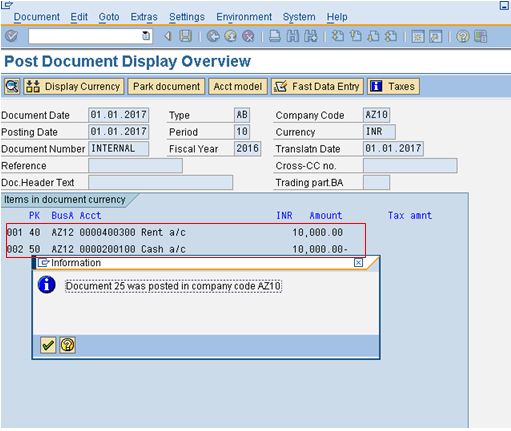 We can see that the Document # 100004 is for invoice which is cleared by document # 200004 which is payment against invoice, so document# 200004 is the clearing document. Reset Cleared Items: This is done to mark it as open. After this, there will be no link between the invoice (document #100004) and the payment document (document #200004). Enter the clearing document number 200004, company code, fiscal year and press save. Then, click button. Give the reversal reason 01 and press enter. The system will show a message that clearing 200004 is reset, press enter. The system will show the message that the document was posted. After this we can see that document # 100004 will again appear as open in the vendor report. And, the document #200004 is cleared by the document #300004. Accrual of an expense is reporting an expense in the period in which they occur irrespective of the payment made and Deferral is payment made in one period, which will be reported in the later period. Let’s start with defining a reversal reason in customizing. Then, click New Entries button and define Reason 09 as explained below. Negative posting: When we reverse a transaction, it reduces from the same side instead of showing it on the other side. So, reverse of rent provision will be shown as a negative balance on the debit side instead of the credit side. Alternative posting date: If we do not select this, the system allows us to reverse document only on the original posting date. We will take an example of provision for rent posting to explain the concept. Provisions are made in one month and the same is reversed on 1st working day of the next month. Enter FBS1 in the command field and provide a reversal reason and a reversal date. For example, rent provision is made on 23.02.2017 and reversed on 01.03.2017. Finally, we should perform reversal of Accrual/Deferral document. Now, we will reverse the rent provision. To do this, enter company code, reverse posting date, check test run checkbox and execute the transaction. After this, select reverse document button and we will get the message that the document was reversed, like shown below. 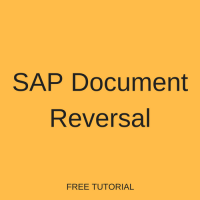 I hope this tutorial gives you a good understanding of the concept of SAP document reversal.